released total 133 faculty vacancies. Application forms can be downloaded from the GMC Mewat official website www.gmcmewat.ac.in. Last date for the receipt of filled applications is 10-11-2017. Last date for Age, Qualification and Experience is 10th November-2017. Application forms should be reached to the office of the Director, GMC, Nalhar through registered/ Speed post. Application fee for unreserved category is Rs. 500/- and for reserved category is Rs. 125/-. 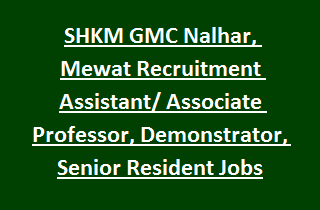 Other details of Eligibility criteria, Application fee, Application Procedure, Selection Procedure, Educational Qualifications and Experience of SHKM Govt Medical College, Mewat Assistant/ Associate Professor, Demonstrator, Senior Resident Jobs Recruitment are mentioned below. Last date for the receipt of GMC Application Forms: 10-11-2017. Total no of vacancies available in SHKM Government Medical College Recruitment are 133 posts. 2. Associate Professor: 21 posts. 3. Assistant Professor: 23 posts. 4. Senior Resident: 46 posts. 6. Casualty Medical Officer: 05 posts. 7. Medical Superintendent: 01 post. Associate/ Assistant Professor: Post Graduation MD/ MS in concerned stream with 3-4 years experience in approved/ recognized Institution/ Medical College. Senior Resident: Post graduate degree in concerned subject. Demonstrator: MBBS qualification from MCI recognized Institution/ University. See the Notification for other posts qualification related information. Pay Scale for Assistant Professor, Professor, Medical Superintendent Jobs is Rs. 37,400/- to Rs. 67,000/- plus allowances. Upper age limit for Associate/ Assistant Professor is 50 years. Age limit for Senior Resident, Demonstrator, CMO Jobs is 40 years. Professor, Medical Superintendent Jobs is 62 years. Government Medical College, Mewat will recruit candidates based on candidates academic qualification marks, Experience. Final selection is based on applicant performance in Interview. Candidates with essential criteria have to download the application form from the GMC, Nalhar official website www.gmcmewat.ac.in. Application forms should be reach before 10-11-2017.